Doctor Who: Big Finish - THE WIDOW'S ASSASSIN Review | Warped Factor - Words in the Key of Geek. Tony Fyler investigates a murder. There are some opportunities in the Big Finish audio range – just as there are some opportunities on screen – that make you ask for ‘permission to squee’ even before you hear them. The Widow’s Assassin is one of those. We’ve already heard one mind-blowing iteration of what happened to Peri after the events of Trial of a Time Lord, penned by Nicola Bryant’s partner, Nev Fountain, in Peri and the Piscon Paradox, but this one promises so much: after much travelling with other companions, the Doctor goes to Krontep, for the wedding of ‘Peri of the Brown’ and King Yrcanos (played on screen of course by King Of Everything, BRIAN BLESSED – don’t blame me, it’s apparently now internet law that his name cannot be rendered in anything but capitals). So – ready to squee? …is when the wheels really fall off the storytelling. To some extent, the solution takes us all the way back to Thoros Beta, so this is by no means a jump-in story, and to some extent, it takes us into the Doctor’s mindscape, but by the time we get there, the twists and turns have become so languid and frankly loopy that we greet each one with a weary shrug of ‘alright, if you say so,’ rather than the ‘Wow, that’s cool,’ that Fountain was probably hoping for. There is a certain thrill in the connection back to Mindwarp, and if the story had simply stuck it out with that thread, it might have delivered the sort of squee factor that dedicated Whovians – for whom this is assuredly written – were hoping for. But the additional loops through which it goes, plus the moderately farcical final act, with Nicola Bryant and Colin Baker running round impersonating each other (oh it’s trippy, this one, I promise you) is over-extended to the point where, long before the final solution is reached, you’re wondering whether it would make you a bad Whovian simply to skip ahead and say you’ve heard it. The Widow’s Assassin fills a very necessary place in the mythos, because now – just as there is with Nyssa – there are two Peris travelling with the Doctor – young Peri, the Peri we know from the screen – and the post-Yrcanos Peri, who’s rather less inclined to take the Sixth Doctor’s nonsense (as she demonstrates deliciously in their next story, Masters of Earth – review coming next Tuesday). The resolution of the Warrior Queen story was necessary to see. It just feels like a slightly unfortunate waste of a couple of hours for it to have been resolved in a story that never really comes together or has a sense of its own pace or ending. 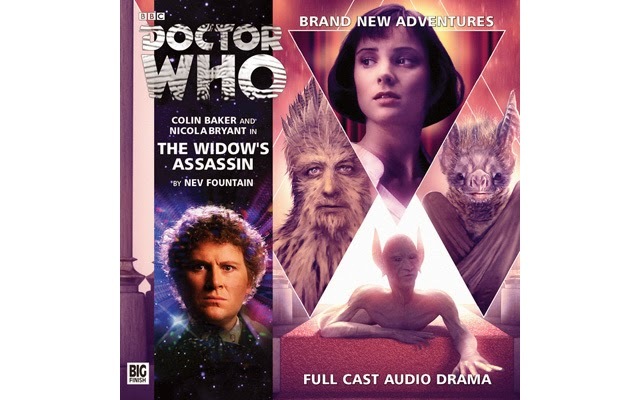 One to listen to over a sleepy Sunday afternoon, perhaps, and one you need to hear to set you up for the new Peri stories, but my no means Fountain’s finest exploration of what happened to Peri after the Time Lords’ intervention.